Operation Game On is actively seeking individual and corporate sponsors to join us as we help combat-injured troops and their families. These combat wounded troops are returning from Iraq and Afghanistan and through golf we have been assisting them with their recovery and transition. Contact us for more information about sponsorship opportunities. Our programs consist of various opportunities involving golf instruction, mentoring, custom club fitting, and several apparel needs and sponsorships at our annual Operation Game On Golf Classic golf tournament. It takes $1000 to send just one troop through our multi week program. There’s so much more we’d like to do and with the help of donations we can turn the future around for the entire family of our combat heroes. What could an individual sponsor do? Donate $1000, or $500 sponsor level today or $100, $50, $25. Every bit helps. Donate Online. Sponsor a foursome of Troops or their Wives to play at your local golf club. What could a corporate sponsor do? Sponsor the purchase of Adidas golf shoes and TaylorMade golf bags. 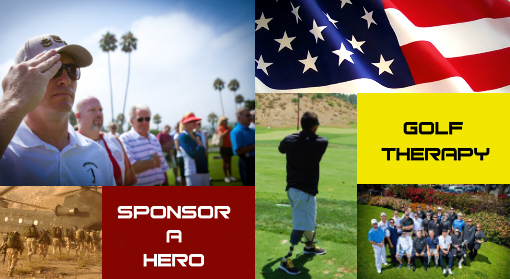 Sponsor a give-away item for our troops or for the participants at our next golf event. Donate your company’s time or services. Donate complimentary tickets to local events for troops involved in our program. Help us raise money at your business –we’ll build a mini-campaign to fit your needs. Become the Title Sponsor for the Operation Game On Golf Classic. If you are attending one of our events; you’ll find that getting to know other golfers and networking with area business owners can be some of the most productive use of time and well worth the price of donation. At the end of the day, knowing our heroes and their families benefited greatly is a very rewarding feeling. We are giving them a game that will get them out there and enjoying a somewhat normal life again. With your help, It’s GAME ON!